SoftBank's plan to buy a slice of Uber at a steep discount is inching closer to the finish line. Two of Uber's major investors have agreed to sell some of their shares to a group led by SoftBank (SFTBF) and investment fund Dragoneer, SoftBank said Wednesday. 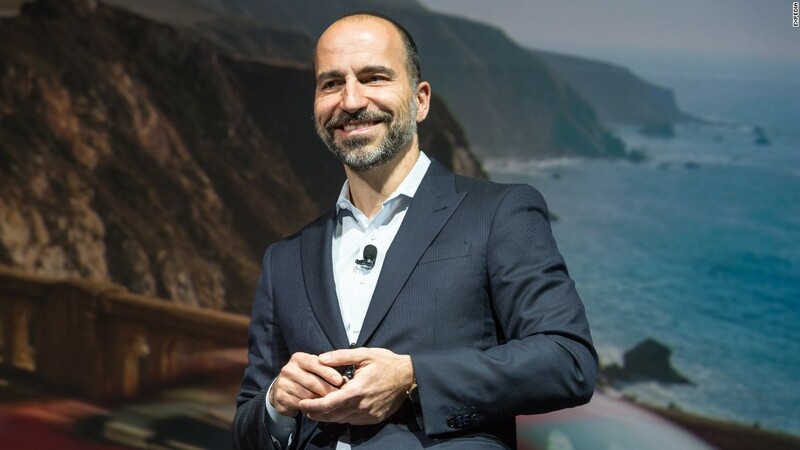 The multibillion dollar investment would be an important boost for the ride-hailing firm and its new CEO, Dara Khosrowshahi, after months of turmoil. But it would also value Uber at about 20% less than the $68 billion that investors thought it was worth in its most recent funding round last year. The process of selling the shares to the SoftBank group began Tuesday night on the West Coast. The Japanese company said it had received indications from Benchmark Capital, Menlo Ventures and other early Uber investors that they were willing to sell. The price SoftBank and its partners are offering values Uber at roughly $48 billion, according to a person familiar with the deal. But they also plan a separate investment of about $1 billion at Uber's earlier, higher valuation. Taken together, the investments would give the SoftBank-led group a 13.4% stake valuing Uber at around $54 billion, the person said. While Uber would remain the world's most valuable startup, the SoftBank deal would bring it down closer to Chinese rival Didi Chuxing's latest valuation of $50 billion. Uber sold its China operations to Didi last year. Benchmark's willingness to sell to SoftBank gives the process some early momentum. Benchmark was engaged in a bitter legal battle earlier this year over former CEO Travis Kalanick's role at Uber. Benchmark had reportedly sought a guarantee in writing from SoftBank that the deal would keep Kalanick in check. Kalanick was ousted from the company's top job earlier this year after a series of crises, but he retains a seat on the board. The investment is expected to give the SoftBank group two seats on the Uber board, part of an effort to blunt Kalanick's influence. It is far from a done deal, however. Despite publicly courting Uber for months, SoftBank CEO Masayoshi Son has repeatedly said that he would be happy to invest in Uber rivals if he can't secure favorable conditions. "Depending on the price and the terms, we might change the entity that we would invest in to Lyft," Son told reporters earlier this month. "So again, you never know until the last minute."